DESCRIPTION West Coast modern home located in a quiet large private crescent facing onto green space. 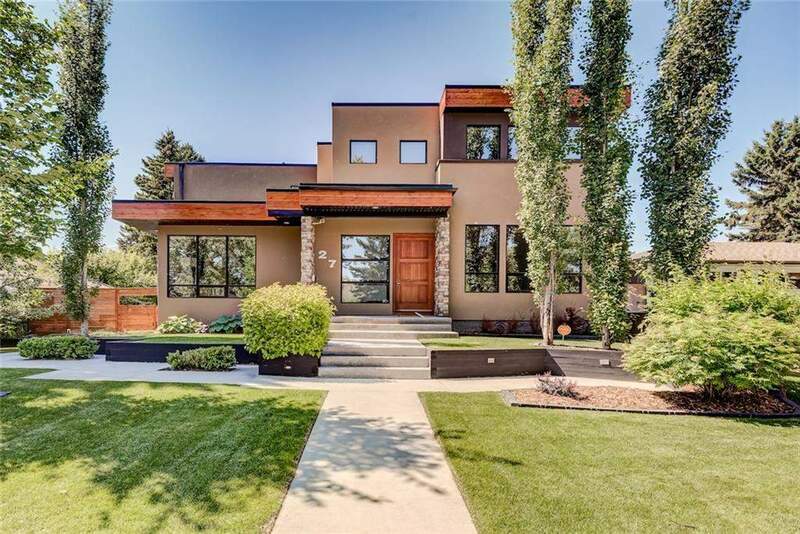 With over 4,700 sqft of developed living space this prestigious home is sure to impress. Step inside to a breathtaking 24ft waterfall in the large vaulted entryway. Main boasts an informal dining rm & living rm, large den/library w/ample built-ins, laundry rm & family rm. Gourmet kitchen w/SS appliances, deep undermount sink, motion & touch faucet, granite counters, breakfast bar & butler's pantry. Formal dining rm makes for impressive entertaining. Gorgeous maple staircase leads you upstairs to the master retreat feat DT/city views & a sitting area w/gas FP, large walkin & 6pc spa ensuite. Two add'l large beds, second laundry & 4pc bath complete the upper level. Walkout lower incl a 4th bed, workout rm, media rm, exquisite wine cellar & an impressive heated 4-car attached parkade style garage. Extra-wide lot feat DT/city views & is steps away from Confederation Park, Collingwood School & the Calgary Winter Club.